Source: Greenwich Graphic. November 30, 1901. 4th Page. Authentic history, as well as popular opinion, has it that of the many bullets fired at the daring General Putnam in his mad ride down the hill which bears his name, one passed through his head-covering, and this has been verified, for the same bullet has been found. 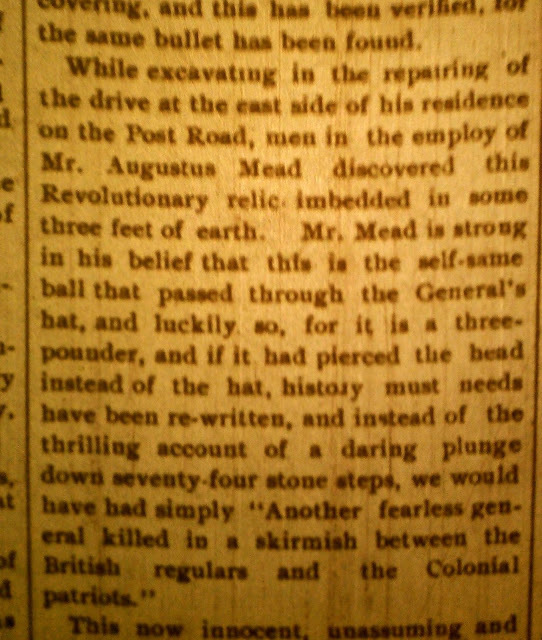 While excavating in the repairing of the drive at the east side of his residence on the Post Road, men in the employ of Mr. Augustus Mead discovered this Revolutionary relic imbedded in some three feet of earth. 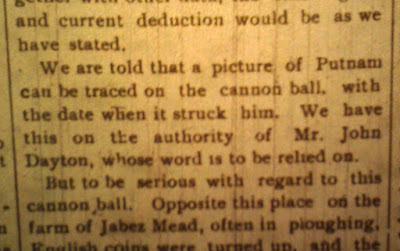 Mr Mead is strong in his belief that this is the self-same ball that passed through the General's hat, and luckily so, for it is a three-pounder, and if it had pierced the head instead of the hat, history must needs have been re-written and instead of the thrilling account of a daring plunge down seventy-four stone steps, we would have had simply "Another fearless general killed in a skirmish between the British regulars and the Colonial patriots." This now innocent, unassuming and harmless appearing piece of Revolutionary warfare we believe, with Mr. Mead, is the bullet which might have caused a change in history and deprived the school boy of what is near and dear to his heart -stories of adventure and daring, and if a thorough scientific and scholarly investigation should be had, with employment of algebra, geometry, or the higher mathematics, taking the hypotheses: the position of the rider, the angle at which the bullets were fired, and the distance travelled, together with other data, the only logical and current deduction would be as we have stated. 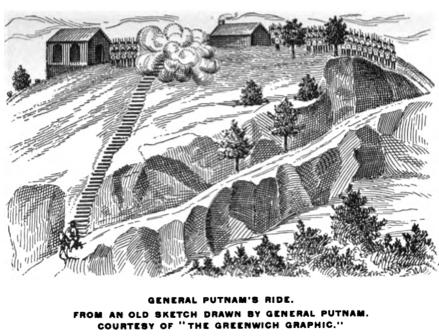 We are told that a picture of Putnam can be traced on the cannon ball, with the date when it struck him. We have this on authority of Mr. John Dayton, whose word is to be relied on. 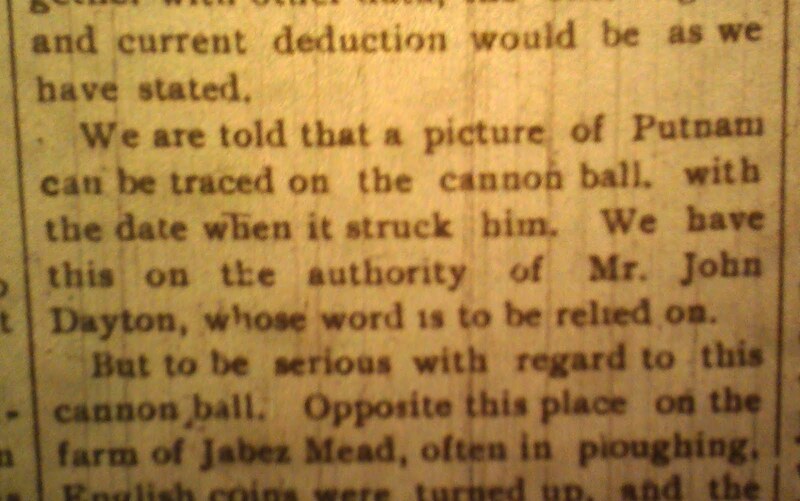 But to be serious with regard to this cannon ball. Opposite this place on the farm of Jabez Mead, often in ploughing, English coins were turned up, and the supposition is, that as more of less skirmishing was carried on in this locality during the Revolution, this evidence of British soldiers is accounted for, as in the case of this old relic of long ago. The New England homestead of Mr. and Mrs. Alexander Mead was gay with laughter and bright and beautiful with flowers on Wednesday evening. Around there genial fireside there assembled a merry company of people, for the hospitable doors with from open to their throng of relatives, friends and neighbors to come to the wedding of their only daughter. The Sanford Mead House, built circa 1849. 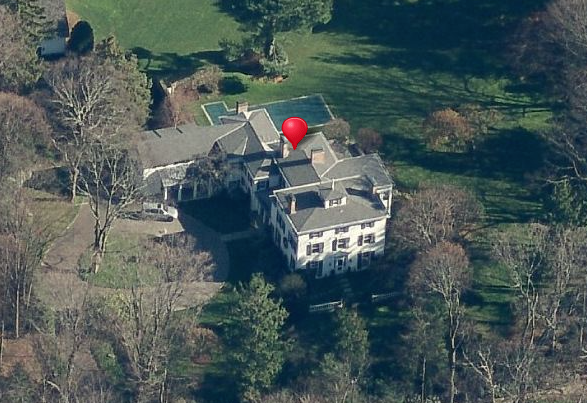 Location: 349 Lake Avenue, Greenwich. It might properly have been called a rose wedding, for this sweet scented flower was to be seen everywhere about the house with palms, potted plants and ferns for a background. In the parlor were brides roses and in the sitting room were bridesmaids roses, in the dining room American beauty roses, and in the hall liberty roses. Roses everywhere in great perfusion, their exquisite beauty and perfume adding much to the joy of the evening. At eight o'clock, when the music of the wedding march caused the hum of voices to cease, Miss Tilly Augusta Mead and Mr. Robert M. Wilcox, escorted by bridesmaid, best man and ushers, took their places is under a beautiful arch of bride roses, entwined with asparagus sprigs, where the Reverend Joseph H. Selden, of the Second Congressional Church, was waiting to receive them to perform the ceremony of uniting them in marriage. Under this beautiful arch of roses, Mr. and Mrs. Wilcox were soon wedded, and after the Reverend Mr. Selden had pronounced them man and wife, they stood there for some time and received the congratulations and good wishes of their host of friends. Supper was announced about nine o'clock, which was a bounteous feast served by a New York caterer, the table being profusely decorated with liberty roses, and from then on it was, that joy and mirth abounded. The bride was gowned in white satin, with real _______, with pearl ornaments on veil. She carried a large shower bouquet of lilies of the valley, tied with a white satin ribbon. The bridesmaid was Miss Grace Child, who is attired in white organdie, trimmed with white satin ribbon. She carried a shower bouquet of bridesmaids roses, trimmed with pink ribbons. The best man was Mr. Henry S. Mead, brother of the bride. The ushers were Messrs. Sanford Mead and B. Frank Mead. Mr. and Mrs. Wilcox received many tokens of remembrance, there being a room full of presents, among them being several hundred dollars in gold pieces. About ten o'clock the bride and groom disappeared to get ready for departure, they to take the 10:57 train for a wedding trip. Of course there was the usual rice bombardment on the way to the conveyance. A number of young men had hired a carriage to see them off in proper manner, and they performed their duties to the letter. 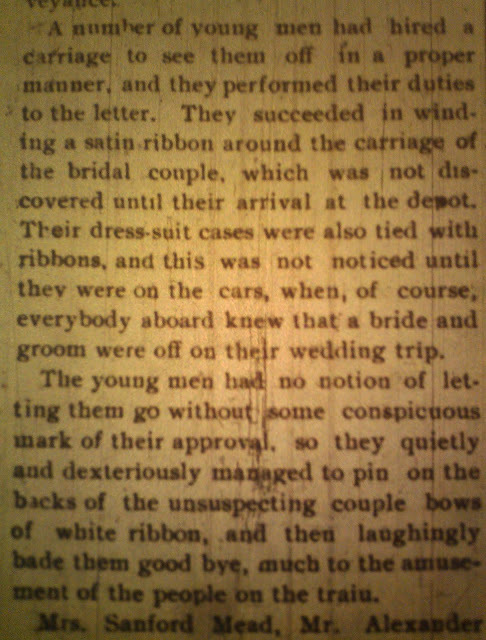 They succeeded in winding a satin ribbon around the carriage of the bridal couple, which was not discovered until their arrive at the depot. Their dress-suit cases were also tied with ribbons, and this was not noticed until they were on the cars, when, of course, everybody aboard knew that a bride and groom were off on their wedding trip. 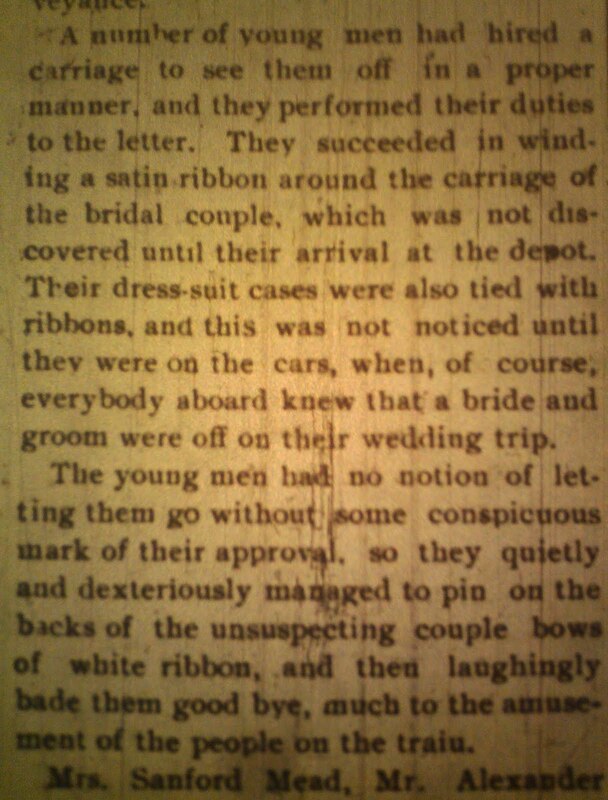 The young men had no notion of letting them go without some conspicuous mark of their approval, so they quietly and dexterously managed to pin on the backs of the unsuspecting couple bows of white ribbon, and then laughingly bade them good bye, much to the amusement of the people on the train. Mrs. Sanford Mead, Mr. Alexander Mead's mother, who has just passed her 89th birthday, attended the wedding and was as happy and cheerful as any among the merry throng. Mr. and Mrs. J.N. Wilcox, Port Chester, N.Y.; Mr. Arthur R. Wilcox, Port Chester, N.Y.; Mr. and Mrs John F. Mills, Jr., Port Chester, N.Y.; Mr. Charles D. Sims, New York; Miss Alice Boun, East Orange, N.J.; Mr. George W. Samson, New York; Mrs. Cornelius Minor, New York; Mrs. Frank H. Mills, Poughkeepsie, N.Y.; Mr. John H. Ruckle, Hackensack, N.J.; Miss Emma Ruckle, Hackensack, N.J.; Mr. and Mrs. H.S. Lounsbury, Port Chester, New York; Mrs. S. L. Close, Mount Vernon, N.Y.; Miss Irene I. Beebe, Brooklyn, N.Y.; Mr. and Mrs. Joseph Seymour, Harrison, N.Y.; Miss Evelyn Bennett, New York; Mrs. W.S. Ludlam, Hackensack, N.J.; Miss Edna B. Brown, Kings Bridge, N.Y.; Miss Blanche Cox, Kings Bridge, N.Y.; Mr. McDonald, Mamaroneck, N.Y.; Mr. J. Willis Clark, Bedford, N.Y.; Mr. and Mrs. Merritt M. Clark, Bedford, N.Y.; Mr. and Mrs. John R. Holmes, Bedford, N.Y.
Reverend and Mrs. J. H. Selden, Dr. And Mrs. L. P. Jones, Mr. and Mrs. Seaman Mead, Mr. and Mrs. Willis H. Wilcox, Mr. and Mrs. George E. Wilcox, Mr. and Mrs. Thomas A. Mead, Mr. and Mrs. Joseph Brush, Mr. and Mrs. Seaman M. Mead, Mr. and Mrs. Augustus Knapp and family, Mr. and Mrs. Silas E. Mead, Mr. and Mrs. Joseph MaManendez, Mr. and Mrs. E. Elbert Gale, Miss Amelia W. Mead, Miss Susan Mead, Miss Louisa Mead, Mr. Augustus Mead, Miss Amelia Mead, Miss Catherine Mead, Miss Lisa C. Mead, Mrs. C. Porloin, Miss Ella P. Mead, Miss Alice Mead, Miss Bessie Gale, Mr. and Mrs. William H. Mead, Mr. and Mrs. James R. Mead, Mr. and Mrs. Howard O. Child, Miss Lelia Peck, Mr. Norman T. Reynolds, Mr. Frank V. R. Reynolds, Mr. Chester P. Child, Miss Grace Child, Miss Laura D. Mead, Miss Edna Kimball, Miss Mabel West, Miss Alice M. Mead, Miss Clara Belcher Mead, Miss Bertha M. Mead, Mr. B. Frank Mead, Mrs. Mary E Mead, Mrs. Searles, Mr. Sanford Mead, Mrs. Carl E. Martin.